Both current and previous members of our armed forces often face issues of stress that most civilians are unable to grasp. At Tracy Quantum, we offer specific, tailor-made meditation sessions and motivational coaching that can help both currently serving military and veterans to cope with stress, disability, TBI (traumatic brain injury) and PTSD (post-traumatic stress disorder). Completely confidential, we offer both group and private sessions that can help build inner quiet and peace, that will help facilitate the healing process from trauma. Meditation is not a new subject for the Armed Forces. In TIME magazine’s recent article: “Samurai Mind Training for Modern American Warriors”, meditative techniques for both dealing with the stresses of combat, as well as dealing with combat itself, are now being closely researched by the United States Military. The Army is especially interested in the positive effects of meditation on helping veterans ease back into civilian life. Although we do not offer combat meditations, Tracy Quantum is an expert in the field of using Meditation in the military to deal with stress, depression, TBI and PTSD. A new study in the journal Depression and Anxiety points to promising results for veterans suffering from PTSD. Researchers found that veterans who engaged in mindfulness exercises, such as meditation, stretching, and acceptance of uncomfortable thoughts and emotions, experienced a reduction in PTSD symptoms compared to their colleagues who did not engage in the same activities. As a Traumatic Brain Injury (TBI) survivor acquired from combat explosions I struggle at times to accept the new me. Life changes after a TBI. The abrupt change from the injury took a toll on my emotions. It brought sadness and frustrations. I was reluctant to accept all the changes that were happening so suddenly in my life because I was on a constant race with the “old me”, reluctant to accept the new me. Great part of the TBI rehabilitation is the acceptance of the new life and owning the injury. It all happens by the acquisition of knowledge and acceptance of the present. The past cannot be changed. The future is what is left to look at, this accomplished by accepting the present. In this journey of self discovery and acceptance, Tracy Dyson provided me with valuable tools and education to keep walking my path in life. I encourage others to use his priceless tools as change happens from the inside out. Healing starts on the inside!!! E. Raymond Rock, on Meditation and the Military – An Oxymoron? Or is Meditation Going Mainstream? 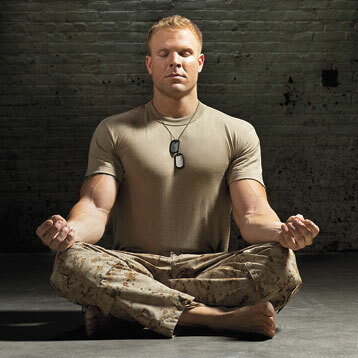 Belleruth Naparstek on Can Meditation Bolster Mental Health in Soldiers and Veterans? If you are interested in learning more about how mediation can help our service men and women, please contact us.